Celebrate the “Celtic New Year” with the world-music scene’s preeminent Celtic party band, Gaelic Storm, Friday November 1st at the Gothic Theatre! Gaelic Storm came to worldwide attention when they were seen as the energetic band playing during the steerage party in the block buster movie, Titanic. Since then, the irrepressible band continues to perform their signature acoustic, indie-folk -rock and world grooves with Celtic tradition, in concert to enthusiastic fans over 200 days a year! The Boathouse has inspired the band as a new way of making music. They refer the idea of traveling to a remote location in order to record for one week as the “Small Batch Sessions.” Pressing a limited amount and offering it only on their website and at live concerts, they make their CD exclusive. Gaelic Storm is: Patrick Murphy (Cork City, Ireland) Vocals, Accordion, Harmonica; Steve Twigger (Coventry, England), Vocals, Guitar, Bouzouki; Ryan Lacey on drums and world percussion; Kiana Weber on fiddle (USA) and Pete Purvis ( Merrickville, Ontario) Uillean pipes, tin whistle, daeger pipes and highland pipes (a Grade 1 piper who toured with award winning pipe bands). (subject to service and handling fees). Tickets available online rialtoloveland.ticketforce.com or call 970-962-2120 or reserve in person at the Rialto Theater Box office, or Medeiros Music, 129 E. 5th St., Loveland. One of the all-time best Irish bands in the world will perform their high octane tunes and songs at the Historic Rialto Theater in Loveland October 25th – with a Rocky Mountain twist! 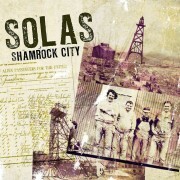 SOLAS, “Irish America’s most influential band” (NPR’s The Thistle and Shamrock), present Shamrock City: a multi-media show of original music, and featuring remarkable photos and stories from turn-of-the-century copper boomtown Butte, MT. Inspired by a family story of immigration, mining and murder, SOLAS and bandleader Seamus Egan will take you on the unforgettable journey of his great-great uncle Michael Conway’s life in Ireland and mysterious death in America. 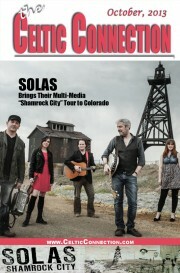 The band’s recent album, Shamrock City, is in the same vein of high level of musicianship associated with SOLAS, but their newfound connection to the Rocky Mountain west has struck a mother lode of new passion in the band’s music. Wear your circa 1800’s Rocky Mountain themed costume to the newly renovated Historical Loveland Theater on October 25th (the Friday before Halloween!) and be a part of the party – you just know it’s going to be a great night of entertainment! It’s a truism, I know, but there really is never a bad time to go to Ireland. From now until the end of spring 2014 is what is sometimes, slightly misleadingly, called the ‘offseason.’ Think about that for a second. The off season in most destinations means most things are closed or closed for most of the time. Not so in Ireland. If there is an ‘on-season,’ it is the summer months. June, July and August are peak months because families can visit without having to take their kids out of school. It is also the time when families typically plan their annual holiday. In Ireland however, especially in the cities, all the attractions and reasons to visit are open all year round, vibrant and fulfilling as ever. The craic is the same in October, November or February as it is in July. the restaurants and bars, the staff and other customers have a lot more time to spend with visitors. and leisure, and lots of time for themselves and their visitors. You’ll notice the change of pace, I promise, and it’s a ‘good thing.’ Something else you’ll notice, and benefit from, is the fact that the price of everything goes down this time of year. them with the preferential rates they already get to come up with some spectacularly good value holiday itineraries. And don’t be scared about the weather. Ireland is the beneficiary of the warm Gulf Stream that laps it’s southern and western shorelines and creates one of the most equable climates in the world. Temperatures stay warm well past the summer months. In fact, in many years October can be as nice as July. Either way, it never gets too hot or too cold. festivals and events in many Irish villages, towns and cities. And it is not too early to think about St Patrick’s Day 2014. 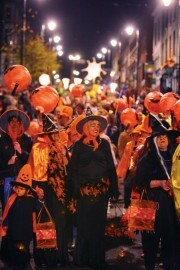 The last few years have seen parades and festivals in all the major cities and towns get bigger, brighter and better. ‘Tis the season to be looking for gold in the mountains – aspen gold, that is. If you’re headed for the Leadville area, you might consider spending a few quiet moments in the Evergreen and St. Joseph Cemeteries, the final resting places of many who came from Ireland to Leadville in search of silver – and a better life. According to the 1880 census, Lake County Colorado had, at that time, the greatest concentration of native-born Irish and Irish Americans of any place between Chicago and San Francisco. Their names echo like roll call at an AOH meeting – Sullivan, Mulligan, Murphy, Moore, Ryan, Kelly, O’Brien, Burns, Reilly, Kennedy, Shea, Powers, Fitzgerald, Harrington, McCarthy, Kehoe and Feehan are but a few of the names found in the Census. One-third of them came from County Cork – likely from the western part of the County on the Beara Peninsula, where the Allihies copper mines in Castletown-Bearhaven once thrived. Others came from Mayo, Tipperary, Waterford, Kerry, Donegal, Cavan, Galway and Kilkenny. Thomas McCullough came from County Monaghan where he was born in 1831 only to pass away in Leadville in 1888. James Cleary was born in County Clare in 1893 and stabbed to death in Leadville in 1913 in a fight over a candlestick that had been made for him by his father, a blacksmith. William Irwin of Limerick, John Dooley of Rusheen, Knockainy, County Limerick, Bridget Shea of Castletown, County Cork and many, many more are interred there. Many had left Ireland during the famine and worked their way west as miners, soldiers, railroad workers and drifters, occasionally with a family, more often alone. Some had been involved in strikes for better working conditions in Cork and later in Pennsylvania. Most of the men in Leadville were miners – men who had worked the copper mines in Cork and the Knockmahon mines in Waterford and the Avoca mine in Wicklow; most of the women worked as domestic servants. Everyone had to work in order to survive. The plots in the St. Joseph Cemetery are large and laid out in traditional Irish fashion to allow families to be together in death as they were in life – except in most cases, in keeping with American fashion at the time, they were bordered with wrought iron fences and not the kerbstones usually found in Ireland. Many of the older plots now share space with decades-old pine trees and aspen groves. And many of the gates around the older plots can’t be opened, blocked by the accumulation of a century’s worth of pine needles. Others, though, are still neatly tended. The Donovan plot is neatly bordered by kerbstones of red sandstone with a patch of shamrocks growing on the threshold. The plot of the Sullivan brothers is covered by a blanket of ground-hugging evergreens. A newer plot for the Kehoes has a marble monument with a small statue of Mary and Joseph holding the baby Jesus. Many of the graves are occupied by infants and children; the average age of adults appears to be in the mid-30’s. It is the rare tombstone or monument for anyone over 50. The impact of the Irish Catholic community was manifested by the establishment of a large church – Annunciation – a school – St. Mary’s, St. Vincent’s hospital and St. Joseph’s cemetery in 1879. That impact also showed up in the naming of many of the mines – with names like the Charles Stuart Parnell, the Wolfe Tone, the Robert Emmett and the Letterkenny mines. The presence of so many Irish also led to visits in the late 1800’s by such luminaries as Oscar Wilde, who read poetry to an audience of miners then descended into a mine and drank as much as the miners; John L. Sullivan, who boxed and got drunk and Michael Davitt, the Mayoman who founded the Land League, who came on a fund-raising visit. Perhaps, using those lists and the various on-line genealogy resources, readers might find a relative and restore their grave – or at the very least, pay homage to those who came before and consider well the price they paid to be here – and what made them leave the soft green hills of Ireland for the hard brown mountains of Leadville. ….So, I am. ….I am going to Ireland – for nine months…..and this is how my passion for that lovely dark isle all began. Well, it all began so long ago that it seems to me like it has always been my passion and my dream to live in Ireland. But, that probably is not so because, think of it? At age 5 – or 7 – or 10, I don’t think I even knew there was a place where the leprechauns lived. So, when did it really begin? I sit today, pondering, remembering, trying to think when I did not have “My Celtic Connection.” It seems like I have always loved Irish music. Then, when I was older, I really loved two special friends who were 100% Irish. One came to Denver from the copper mining town of Butte, Montana. Her family immigrated to Butte fro Alliheis in the Beara Peninsula, CO Cork where similar copper mines were the main industry. Then there was a Hogan, native Coloradan from a big Irish family who farmed in Wiggins, Colorado. These two friends loved all things Irish and especially Irish music. Only a few bars of an Irish jig would bring tears to their eyes. And, I still have the original fold-out map that shows all the Irish surnames and where they came from in Ireland. O’Sullivan and Hogan were circled – in the day. I sometimes dig out that old map when I am a little nostalgic. Now, at that time, I didn’t know I had a great, great grandmother from The Claddagh. Now, it would be about 1960 and women that I worked with would go to the Dublin House near Colorado Springs for dinner and maybe some dancing on the lighted floor with flashing shamrocks. I remember the Dublin House like it was yesterday and it was actually 53 years ago. I was intrigued with the decor there as it had all been shipped from Ireland. I loved the two women from Dublin who owned the restaurant and the funny fact that they always wore SADDLE SHOES! Oh yes, another man we worked with was a young Irish lad who came here from Dublin. We questioned him about Eire until he threw his hands in the air and ran away. We loved his Irish brogue and his lively sense of humor. Unfortunately, like so many, he did not live a long life – but we loved him so. Most importantly, my soul sister and I dreamed of the day we could travel together to Ireland and I actually began dreaming of living there. Later the dream pared down to living there for one year. I read anything and everything I found about Ireland. And I subscribed to “Ireland of the Welcomes” and devoured each issue the minute it arrived. Later on “The Celtic Connection” was born and I was surely hooked on every article. Now, then, I meet and marry my soul mate – not an Irish man, but rather 100% Swede, so my dream is put on the back burner for a few years. He did love to travel though so a wee small voice expressed a desire to include Connemara Country on our first European holiday. There my passion bloomed again after only three days in pouring rain in the West of Ireland. I took pictures in the rain and collected shells on Ballyconneely Bay – treasured to this day. The photos from that magical time still hang on my office wall, faded but treasured – memories of the lovely thatched cottages and the “Tears of God” everywhere (The fuchsia flowers are still my favorite of all flowers.). Yes, I am in love – with that lovely dark isle. My soul mate passed after only seven years of marriage and my sister and I began again our dream of traveling together and visiting Ireland. So we did that, along with my stepdaughter and her Irish husband. Yes, I had a plan. Such a plan. Remember, I had been clipping articles and reading travel articles in “The Celtic Connection” and “Ireland of the Welcomes” for a long time. “Highways and By Ways” always told of off the beaten path, places and things and I loved the clever little illustrations. Yep, I knew where I wanted to go and the others pretty much agreed. My sister bought a bright green sweater with shamrocks and I worked out details of the trip. Unfortunately my sister was ill and unable to make the trip in the end, so she gave the the green sweater to me and I wrote to her every day of the trip to share the magic of Ireland as best I could. Since that time I’ve made three more trips to Ireland – one with my Irish girlfriend, one on my bike, and one on a tandem bike with friends. I’ve written volumes about these trips so I’ll fast forward to last fall. My beloved Westie was killed hiking and I was devastated. But, up popped my dream of living in Ireland for a year as a “native” rather than a “tourist.” That’s when I saw the quote at the beginning of this tale. So, yes, I am going to live in Galway for nine months. I have bought my plaid Wellies. I’ve asked for help from my Irish friends on the little questions that keep popping up – they are a Fermoy family of six, the Oughterard candlemakers and hostel owners in Glenties, CO Donegal. I am getting organized – some say that’s getting to be over the top but “I am what I am!” I’m livin, breathin and talkin (yep, I’ve learned a little “Bite Sized Gaelic”) Ireland in 2014. I’ll be ready! So, “you know all those things I always wanted to do?” I’m doin em! Traditional music sessions come in all shapes and sizes. From the helter-skelter informal gathering where many musicians don’t even know each other and maybe come from different countries, to the more formalized local sessions where it is the same cast of characters from week to week. Sometimes a session is made up of “star” players who might play with each other from time to time and sometimes a session is limited to a small group of band members playing in an informal session setting. The main characteristic of all these different sessions though is the spontaneity, lightness and lift given to the music. Nobody is quite sure where the whole thing is going. The music is meant as much for the players as it is for the audience and because of this, magic happens. Creativity and energy become their own force and the craic can be mighty! Such was the case with a session that my friend Tom and I stumbled into in Miltown Malbay on the west coast of Ireland in 1989. We were at the Willy Clancy School of Music where lessons are taught, concerts are performed and sessions are nonstop. It was late in the evening and we were making the rounds to numerous pubs looking for the perfect session. We were actually looking for the great County Clare fiddlers Bobby Casey, Joe Ryan and Junior Creehan who were teaching at the school and playing the evening sessions. We knew they would be involved in a brilliant session. But they were nowhere to be found. Instead, we stumbled into an amazing session at a pub on one of the side streets in Miltown. And what a session it was. As soon as we entered we could feel the energy and lift of the music and the excitement of the audience. This was what we had been looking for. The place was packed but Tom and I managed to be absorbed into the mass although I ended up a few rows back and to the side of my friend Tom. But we both had a good view of the musicians. Five young players; fiddles, flutes and bodhron. No “stars” here but great players who had obviously been playing with each other for some time and probably part of a band. The sets were new and fresh and the playing was brilliant. There were smiles from ear to ear on musicians and audience. I was in heaven. Drinks were passed on trays overhead, hand to hand by the audience, and nary a drop was spilled. This was perfection! But not long after Tom and I had settled into our cramped surroundings I noticed a hulk of a man enter the pub and proceed to rudely make his way through the packed crowd towards the music. This man was over 6 feet tall with broad shoulders and determination on his face. Not a man to be trifled with. As he neared Tom, I watched Tom step back as best he could and make room for the man to pass. Tom later told me he thought the man was urgently on his way to the rest room. Instead the man stopped right in front of Tom and filled the space that Tom had graciously opened for the man to pass. Tom’s view of the musicians was totally blocked by this “wall” of a man. Tom caught my eye with a mixture of amazement and total irritation. There wasn’t much I could do from my position that wouldn’t have ruined the night for the entire pub. Tom was on his own. Several times I watched Tom try to get the man’s attention but to no avail. He ignored Tom completely. This man knew this was where he wanted to be and he was staying there. The music rolled on, a perfect sound track of wonderful intensity. At one point a large tray of drinks was passed over Tom’s head and for just a second, as Tom was passing the tray, I saw him pause and look over at me. A tray full of drinks down the “wall’s” back would surely get the man’s attention and no doubt give Tom great satisfaction. But ever the gentleman, Tom passed the tray on. He later told me that tipping the tray would have also doused the musicians and denied the drinks to those in need and he couldn’t do that. But Tom had a plan. Shortly I noticed the “wall” moving in a curious way. Not in time to the music but to some seemingly invisible force of discomfort. Then I caught a brief glimpse of Toms needle-like elbow buried in the “wall’s” lower back in the area of the kidneys. That had to be uncomfortable. Several times the man tried to turn around and say something to Tom but the music was loud and the place packed. Tom kept at it. I waited for the man to explode but to my amazement and Tom’s relief (to say nothing of his safety) the man parted the crowd and left in a huff. Tom didn’t look at me but the smile and satisfaction on his face were clearly noticeable. Mission accomplished! The music continued long into the night and all was perfect again. The next day Tom had planned a trip to the Aran Islands with friends. They would leave from Doolin pier taking one of the small tourist boats out to the islands for the day. As Tom recounted to me later, he found a seat just back from the starboard railing and a bit sheltered from the wind and spray by a friend sitting in front of him. The seas were a bit choppy but the small boat cut a clear path through the waves. The mood was jovial. But at one point, the friend sitting in front of Tom left to get some refreshments. The boat took a sudden and sharp turn to port and Tom was doused head to toe with a large wave. Was this all a coincidence? Wiping away the spray of cold seawater from his eyes Tom looked back at the wheelhouse and there stood the captain, with a large grin on his face. The recognition was immediate. The captain was the “wall” from the night before. He had gotten his revenge and it obviously delighted the man. What a small world Ireland is! And this goes to show that a dose of revenge is a good pill for a pain in the back. On Wednesday, October 23, 2013 global powerhouse, Celtic Thunder will play in concert at the Pikes Peak Center and on November 26 at the Budweiser Center in Loveland. Named Top World Music Artist twice by industry bible Billboard, Celtic Thunder’s six male soloists perform both solo and ensemble numbers. They are known for performing an eclectic mix of songs, ranging from traditional Irish fare to international hits such as “The Boys are Back in Town” and “Still Haven’t Found”, as well as original compositions by the musical directors/composers and individual group member Keith Harkin’s “Lauren & I”. Their live shows are recognized for the use of dramatic effects via lighting and choreography as well as a stage set resembling an ancient stone pathway drawn from Celtic lore. A highly anticipated television special surrounding the MYTHOLOGY tour began airing nationally on February 28, 2013. Celtic Thunder has become one of public television’s largest draws. In terms of viewers, their shows have aired over 16,000 times on Public Television. The group is among the top five audience-generating acts on the network. Check local listings for airing dates/times of Celtic Thunder’s new MYTHOLOGY special. Aer Lingus International Hurling Festival took place in Galway September 18-21 as part of the Gathering 2013 initiative. Teams from all over the world were invited to compete in Irelands’ National sport in the first ever International Hurling Festival – there was only one catch, you could not be Irish! As the American born players were preparing to depart for Ireland they received words of encouragement from Shay Dunn, fellow player, coach, and one of the founders of the Denver Gaels. Shay’s words surely hit the mark, as Denver/Indy beat the Argentina (Buenos Aires) team in the final to win their division Championship! They had beat Argentina earlier in the tournament, as well as teams from Europe and Barleyhouse/Allentown on the road their championship. Congratulations Denver for competing in the purest sense and making us all proud! The Ireland Oil and Gas 2013 Summit held in Dublin September 10-11 was the first of its’ kind in Ireland, and based on its’ success, plans are moving forward to make it an annual event. The all-encompassing agenda for the two day Summit covered key areas of the oil and gas industry such as the exploratory advancements, investment opportunities, operational challenges and updates on the regulations that affect exploration of onshore and offshore regions. Attendees at the inaugural Summit included Fergus O’Dowd TD, Minister of State, Dept of Communications, Energy & Natural Resources and Environment. Chairing the Summit was Susan Morrice, Chairperson of Belize Natural Energy (BNE). Susan is a native of Belfast, but now living in Colorado, she was asked to speak on the successful business application of the EDUCO Holistic Energy Model. That “remarkable success story” of BNE was realized in 2005 when the company, backed by Irish investors, found very high grade oil onshore Belize. Prior to that, the world’s biggest oil companies explored the area unsuccessfully and left with the belief that no oil could be found. Not only did BNE discover oil, but the quality of the oil was so good and light that locals put it directly in generators, and Shell Oil now buys all of their exports. Since the discovery of oil, over 400 new jobs have been created in Belize by BNE which has become the number one revenue generator in the country. In addition, the company has received industry recognition for Green Company of the Year (2011), Employer of the Year (2012), and GetEnergy Global Education and Training in Exploration Award (2013) -received competing against 40 other countries and companies.